A parliamentary report of 1776-7 listed a workhouse at Holy Cross which could accommodate up to 80 inmates. Worcestershire: Abberton, Besford, Birlingham, Bishampton, Bredicot, Bricklehampton, Broughton Hackett, Charlton, Churchill, Cropthorne, Defford, Dormestone, Eckington, Elmley Castle, Fladbury, Flyford Flavel, Grafton Flyford, Great Comberton, Hill and Moor, Holy Cross in Pershore (including Walcot and Wadborough)(3), Kington, Little Comberton, Naunton Beauchamp, Netherton, North Piddle, Norton-juxta-Kempsey, Peopleton, Pinvin, Pirton, St Andrew in Pershore (2), Spetchley, Stoulton, Strensham, Throckmorton, Upton Snodsbury, White Ladies Aston, Whittington, Wick, Wyre Piddle. The population falling within the Union at the 1831 census had been 12,563 with parishes ranging from in size from Bredicot (population 52) to Holy Cross parish in Pershore (2,145). The average annual poor-rate expenditure for the period 1833-35 had been £5,917 or 9s.5d. per head. 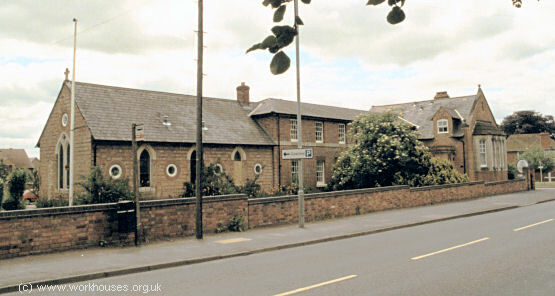 The new Union workhouse was built in 1836 to a design by Sampson Kempthorne who was also the architect of the workhouses at Droitwich, Martley, and Upton-upon-Severn. The workhouse site was on the east side of what is now Station Road, and was on land bought from Lord Coventry. It was designed to accommodate 212 inmates and the total cost was around £3,500. Kempthorne's design was based on his "200-pauper" plane which had a entrance block at the front with a cruciform layout providing separate accommodation for the different classes of inmate (male/female, infirm/able-bodied etc.) However, there was no central supervisory hub. The workhouse layout can be seen on the 1904 map below, with the entrance facing onto the road at the north-west. Pershore from the north-west, 1895. A separate infirmary block, together with Guardians' board room and clerk's office were added in the 1890s. After 1930, the site became a Public Assistance Institution, then an old people's home known as Heathlands. 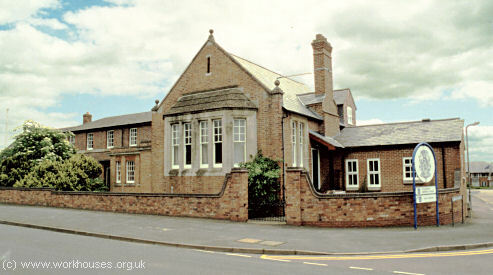 Only the former entrance block, board-room and chapel now survive. Pershore from the west, 2000. Pershore from the north, 2000. 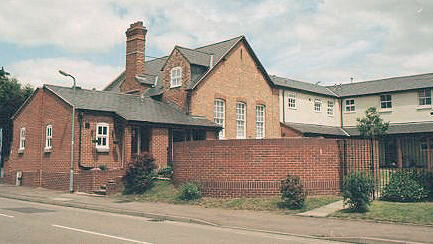 Pershore from the south, 2000. The infectious wards have been lately	used for the accommodation of tramps who have been swarming. These wards, which have barred windows and only one exit, have sometimes accommodated many young children for weeks together and, after what happened in the early hours of a	recent morning, there is reason to be thankful that the district has escaped a	tragedy. The Master and porter were aroused in the night by a great noise made by the tramps who complained that they were	being choked. Thick smoke was rising from the floor, and on a builder being summoned, it was discovered that a joist, built directly under the hearth, was nearly burnt through. Fortunately the dangers arising from	the stupidity of construction were minimised by sheet iron protection, or	there would probably have been a serious fire and possible loss of life. The Pershore Board of Guardians have directed that a thorough investigation shall be made, and any existing defects remedied, and the bars from the windows will be removed. The Pershore Fire Brigade is also to be put in a position to cope with a fire at the Workhouse by being enabled to pump straight from the river, a very proper precaution in view of the inadequacy of the existing supply of water at the institution. Worcestershire Archive and Archaeology Service, The Hive, Sawmill Walk, The Butts, Worcester, WR1 3PB. Holdings include: Guardians' minute books (1835-1925); Creed register 1907-30; Register of infants (1921-30); a variety of administrative and financial papers.